Keeping my promise/threat to show you my old clothes — because this blog is conceptual, not commercial — today I am taking you back to 2006. I first wore this ensemble in 2006. You may wonder how I remember the year so well. Easy. 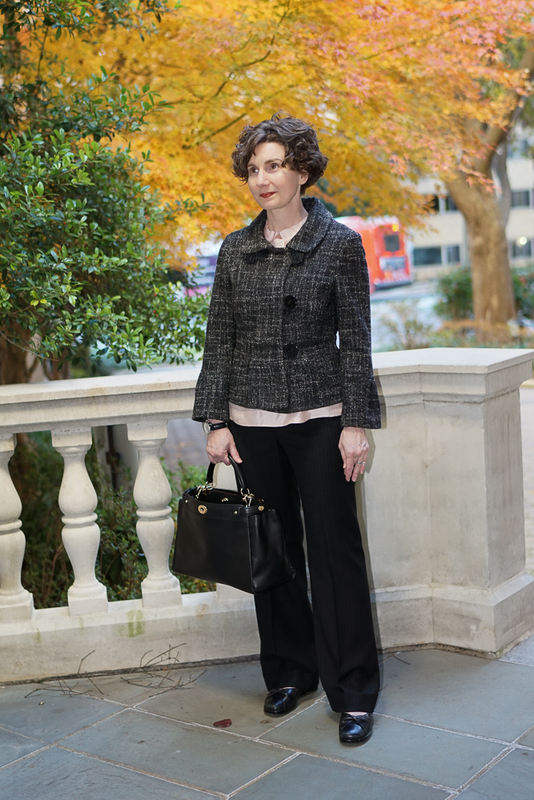 I wore this jacket/blouse/trouser ensemble for a deposition in St. Louis, and I had to stay at the one of the airport hotels because all the downtown hotels were booked. Why? Because the Cardinals were playing in the World Series. It may be hard to see in these photos, but my pants are faintly pinstriped. You know I like a tweedy jacket with a pinstriped pant. The blouse is a pink organza which, despite the delicacy of such a fabric, is still thriving in my closet. You’ve seen this jacket before. It was a little too big for me, but rather than spend a lot of money having a seamstress take in the seams, we just moved the buttons over. A very easy fix. The buttons were originally off-center (i.e., asymmetrical) and I just made them a little more off-center. 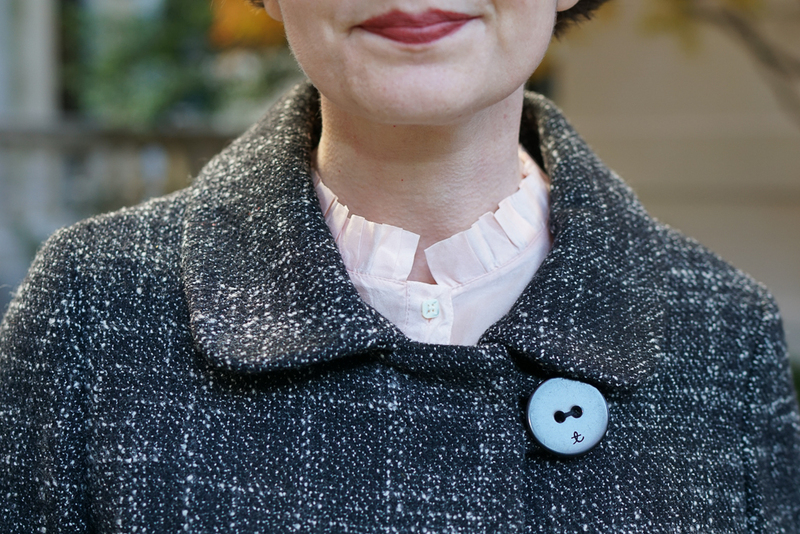 standing collar and tiny square buttons. To compensate for showing you something old, I will show it in more than one way. That seems a fair trade, no? With a turtleneck for days that are particularly cold or your mood is severe. I love turtlenecks even if they make my face look very round. 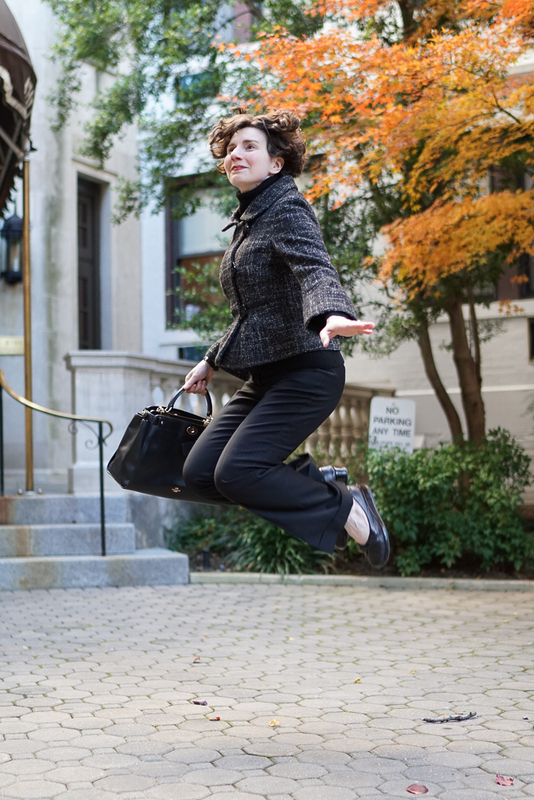 The Photographer asked me to turn, but I did one better, I jumped and turned –catching him by surprise. He was very disappointed that he didn’t catch me in mid-air. * When I arrive in a hotel room,+ I check the room very carefully for . . . my murderer . . . who I am always sure is patiently waiting in the closet, behind the drapes, or under the bed. (Or in the shower, if the shower curtain is drawn.) When I checked under the bed in St. Louis, I found: a pizza box, a crumpled napkin, and an old foam hair curler. It’s the only time — in all of my travel — that I’ve ever found anything under the bed. Who would put a pizza box under a bed in a hotel room? In any room? ** Ten years of ballet lessons and this is all that remains. + Surely I am not the only one who looks under the bed when staying at a hotel? What are your travel rituals? 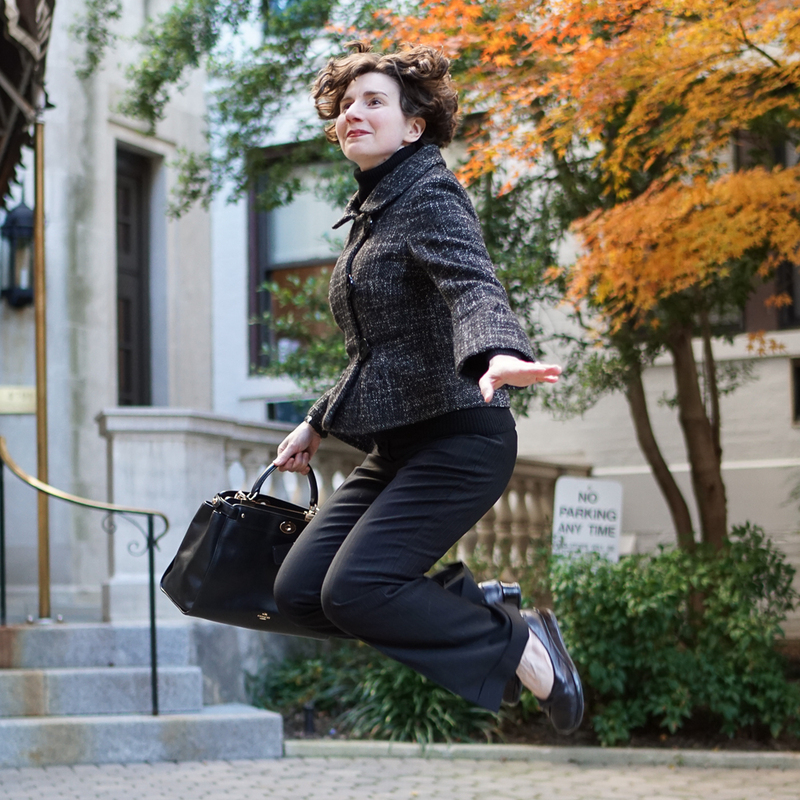 THANK YOU for the Halsman link–some of my favourite people there– and yes, you also show something different in a jump. Love it! The expression on your jumping face just slays me ! The whole body language says “no sweat I got this”. Loved this. How interesting the jump concept and truly shown in the pictures. That outfit looks fabulous, made all the more impressive by the jacket so well fitted by moving the buttons. The jacket is really a keeper. You look terrific. 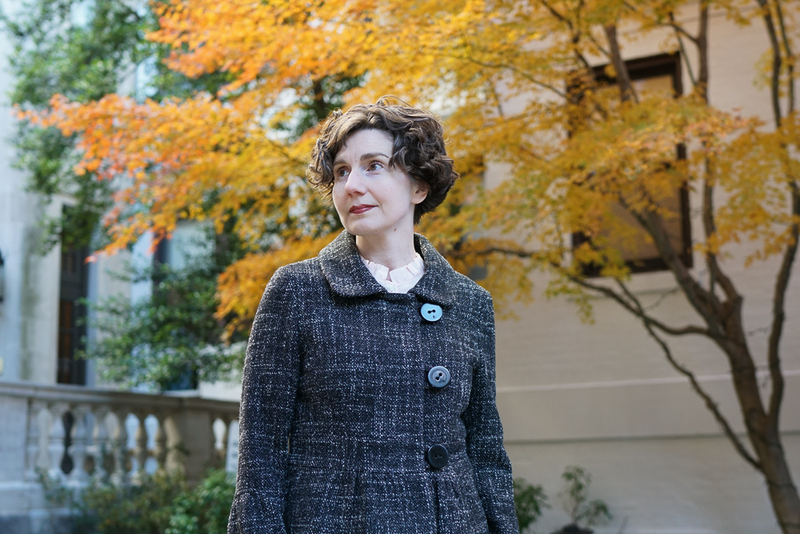 The jacket is classic – so feminine with the subtle pleating. I now believe I need a few pink/blush blouses as a neutral backdrop. Love the jumping photo. Of the two iterations, I prefer the one with the pink blouse — a little softer and less severe than the very dark combo below. But proportions work well in both — and love the contrast of the very colorful backgrounds with the less colorful ensemble. I’ve recently discovered blush as a very flattering alternative to black or white for me — I fear it means I’m losing my edge as I age, but I guess vanity wins out over looking wan. (To clarify: you don’t look wan. But I do when I wear too much black… or I just look tired. Either option ain’t great). Oh the jump is wonderful! And you look like you enjoyed it. 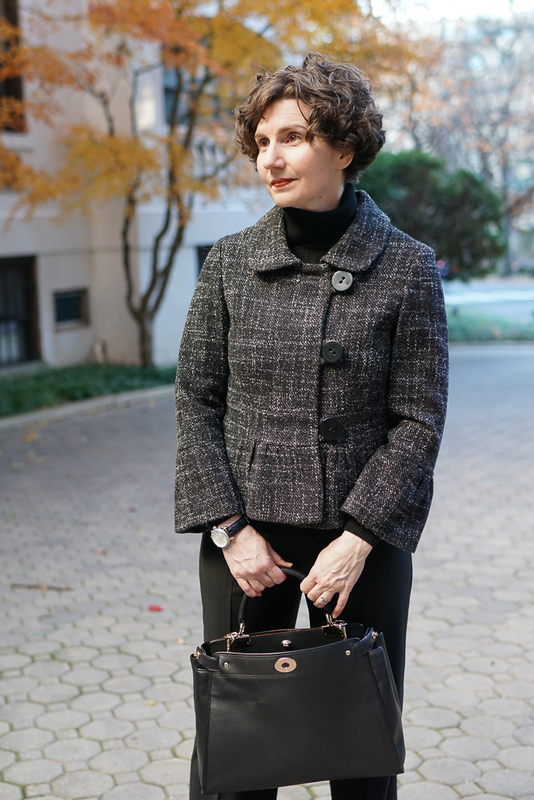 The jacket is a keeper and l like both the blouse and the turtleneck with it. Great idea to check out the hotel rooms. I miss that DC foliage & the real life cuteness of the Directrice but love you and your fabulous blog! The foliage was beautiful but now it is very cold. Brrr. Come back anyway! Thank you for the link to the Halsman photos, I had not seen those before. And thank you for showing off your “old” outfit that clearly shows that classics can pass the test of time. 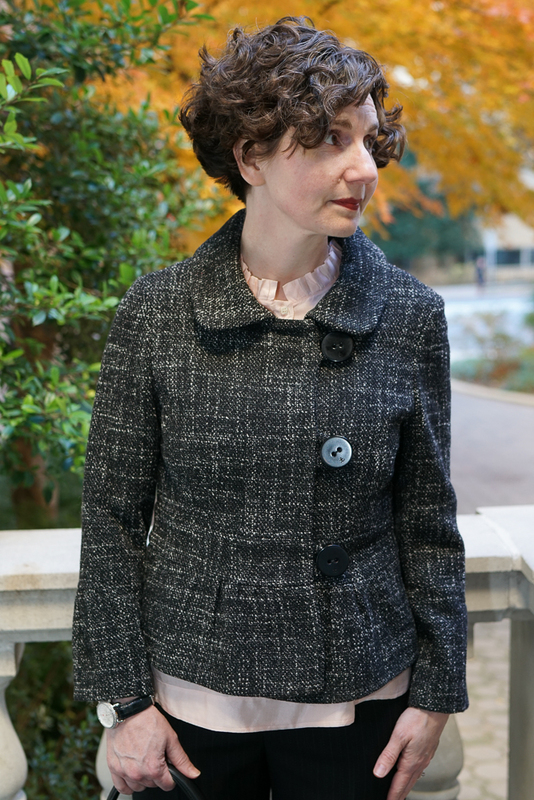 I myself pulled out a 2010 J.Crew jacket just last week when I wanted to dress up a bit for a presentation. The jacket still looks great and I feel great wearing it, and I can see myself still wearing it 10 years from now. Having experienced two hotel fires, the first thing I do when arriving to my room is map out the escape route. On the subject at hand, the jump is fun. And, I’m going to have to reconsider blush. I’ve always thought it was insipid, but it’s really no more so than off white. That is a very nice jacket, and well worth seeing more than once. The wee blouse really is delightful; why are square buttons so very charming? I love the look of the turtleneck, but I can’t wear them myself; I invariably feel I am being strangled.